Meet our new craftsman Patrick Ashley. Patrick founded New Mission Workshop in 2000 and has been producing high quality clocks and furniture pieces adhering to the principles of the Arts & Crafts aesthetic in both design and craftsmanship. You can tell he has an eye for Arts & Crafts design because it is hidden somewhere in his passion for new designs. Patrick was first introduced to wood working in high school. Looking for a genre to work in, he chose Arts & Crafts for its simplicity. That choice continues to this day because Patrick believes in the theory the simplest design in which nothing is superfluous is also the best design. Located in upstate New York, Patrick�s mentor is William Keyser, renowned Professor Emeritus, School for American Crafts, Rochester Institute of Technology. 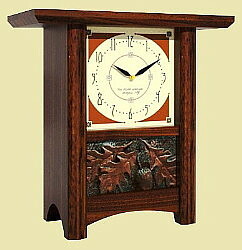 Here are 2 of his popular clocks, see below. Be sure to visit his Accessory Furniture shop; an option on the previous page. 18� tall crafted of cherry, walnut, walnut burl, ebony and paduak with a satin polyurethane and waxed finish. Features a copper etched face. 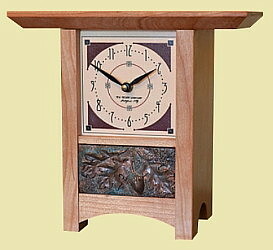 Battery operated quartz movement with a brass pendulum. The tile insert is by Motawi Tileworks. 8.5� tall and can be crafted in walnut (above left) or cherry (above right) finished with a satin polyurethane and waxed finish. The face is a giclee printed custom design signed New Mission Workshops Pittsford, NY. The tile insert is sculpted oak leaves and acorn Permastone painted copper tone. 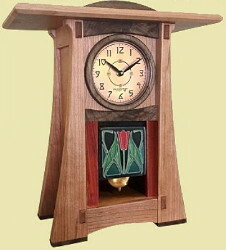 NOTE: Patrick crafts clocks to the order and a 25% deposit is required. Please allow 2-3 weeks for delivery.